A terrific operations manual for getting and staying in the driver’s seat of life. Making Yourself Indispensable is an inspiring guide to being accountable in all aspects of your life – from work to home to relationships. This new edition only adds to the book’s value as a roadmap to achievement and a source of practical wisdom. El trabajo de Accountability desarrollado con el equipo directivo ha sido clave a la hora de alinear la visión que los diferentes directivos teníamos sobre “empowerment” y nos ha permitido trasladar un mensaje consistente y poderoso a la Organización sobre lo que esperamos de nuestros empleados. El impacto del curso y del material se ha traducido en un mayor liderazgo de los mandos intermedios que has “reinventado” su rol para afrontar los retos de la organización con mas ilusión, energía y madurez. Mi experiencia es que se trata de una herramienta muy poderosa para alinear a una Organización con sus objetivos. The Accountability Workshop carried out with our Leadership team has been critical in aligning the vision of each leader around self and employee empowerment, and it has allowed us to send a consistent and powerful message on what we expect from our people. Then main impact has been the reinforcement of the leadership of our managers whom have reinvented their role to face the challenges of the company with enthusiasm, energy and maturity. My experience is that Accountability is a extremely powerful tool to align an organization towards its objectives. “Personal accountability is hugely important for individuals who want to be successful. At Goodrich, we have adopted and advocated for this approach and are seeing it become part of our DNA with great benefits to our business and our workplace. If only this was compulsory reading for all of us, with timely reminders to each other when we fall down in to the “victim part of the accountability loop” – I think the world would be a better place. I have known Mark Samuel in multiple business consulting settings over many years and I have seen him address and positively transform the biggest corporate challenges you can imagine. Mark has a unique genius for strategy, transformation, and helping others to personally and professionally lead meaningful change. This amazing book is absolutely invaluable and offers the reader so much more than a clear way to create job security and new opportunities at work. This book is about being and feeling your best in everything you do. It will change the work world, and ultimately has the power to change families, habits, old patterns and relationships of all kinds. Must read! “Making Yourself Indispensable” talks to you and encourages you. It is like having a professional career coach at your finger tips to help you improve and be more effective. It gives you principles and a new mindset that you can put to use immediately to make a difference. It makes you think differently. It builds your confidence that you can do better. This book is indispensible. 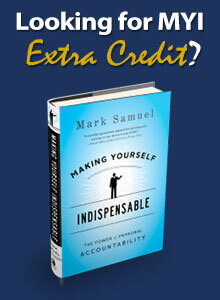 Mark Samuel has written such a clear and practical book on how to make oneself indispensable. The gift of this book is the ability to adapt the processes to our own lives and walk away with measured steps to take and apply to any situation, which is truly empowering. “Making Yourself Indispensable” made me aware of my hidden imperfections, my strengths, and my “purpose driven” career on a deeper level. This is a book I will use again and again. Thank you, Mark Samuel! Mark Samuel has written an insightful and very practical book that is not just about personal accountability but also about what accountability will help us achieve: “indispensability”. Samuel demonstrates an exceptional understanding of the psychological underpinnnings of people’s behavior as well as a firm grasp of the realities of today’s workplace. Consequently he appreciates the subtlety of the many problems we face and does not oversimplify. He offers stimulating ideas, exercises and solutions and that will have value for just about everyone. In short, Samuel has made an extremely valuable contribution to our understanding of accountability and to our quest for the kind of successful life/career that has true accountability at its core. The lessons learned in Making Yourself Indispensable take the mystery out of accountability by not only providing a foundational language for practicing accountability, but a complete roadmap as well. It has been my personal experience that by applying these principles across an organization, people do transform, ultimately leading to more accountable individuals, teams, and organizations with improved business results. So what really makes an employee high potential? In very pragmatic terms Mark Samuel relates how it is not enough to be a subject matter expert or perform to a list of leadership core competencies. Regardless of the complexity around us or the briskness of the winds of change that may attempt to drive us off course, taking initiative, being consistent and having others count on us to do what we say will we do – true acCOUNTability – sets people apart – Particularly if we intend to make the most of what we do, and importantly who we ARE, in service to others. Accountability is a key concept in moving an organization forward, especially in a challenging business climate. The principles and practices expressed in Making Yourself Indispensibleprovide a clear, concise pathway for easy and efficient application in today’s competitive business environment. Of equal significance is the manner in which the author demonstrates how these same principles, when applied to one’s personal life, can enhance one’s sense of gratification and achievement , contributing to their professional life. The personal accountability model allowed us to build a clear vision of excellence for our future and gave us the opportunity to define our path of success. It was understood for all levels of the company. Our new habits of execution and priorities brought about our expected results. Our focus was the human factor and his motivation toward better interaction and execution. I am convinced that the Personal Accountability Model was the best way to achieve outstanding results. ~Mary Ann Sutherland / Vice President, Human Resources – DST Output, Inc.